Today I am exploring a relatively recent irrational fear. No, it is a fear that I have had for as long as I can remember, but until last month, I thought it was a very reasonable fear to harbor. Dollissa and Frant were visiting me, and I mentioned this preoccupation of mine, and why I could never really enjoy balloons at all, and couldn’t understand why people seem to enjoy them so much when they could kill you. They were bewildered. Then I explained that if a balloon popped and I gasped and it became lodged in my throat, it wouldn’t be easy to get out because it would stick to my insides, and that would be a terrible way to go. Then they explained that my worry was completely insane, and why would I ever even think that. That’s a very good question. Why WOULD I? Maybe a human gasp isn’t strong enough to drag a balloon all the way down your throat. Maybe the odds of the balloon piece flying directly into my open mouth are unbelievably minuscule. But maybe it could happen?? I don’t want to take that chance. 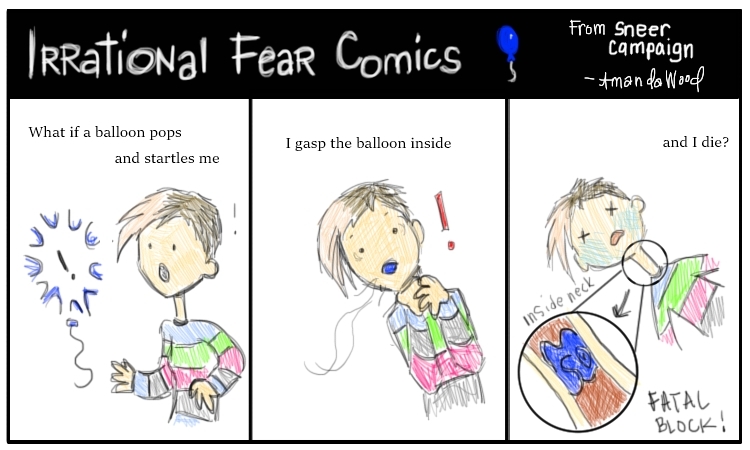 Sadly I can’t say that my fear has been eradicated by the scoffing of my friends, but I can say that I have had many years of not enjoying the company of balloons, and even water balloon fights had an added layer of dread for me. This irrational fear is staying right in place.